We often get questions about how sitemaps control the search results for a given site. The answer is, they don’t! This page will describe to you the relationship between sitemaps, search indexes, and the search experiences you create through the Admin Center. Imagine a big lake. There are any number of tributaries feeding into the lake. There are fishing boats out on the lake, each loaded up with the gear they need and a guide to the kinds of fish they’re trying to catch. Like a lake with its fish, the common search index has all the content from all the sites we index, ready to be brought up by any number of different search site configurations. The main difference in the search site setup process is the source of the web results. Like Google and Bing, when we index your content, we collect every site’s web pages into a big, common index. All search sites using our index reference this same common data pool. XML Sitemaps are like tributaries feeding into a lake. They do not feed into sitemap-specific indexes connected to particular search sites. Sitemaps list the content available on websites in a machine-friendly format, so that search engines will know what to collect from the site. The content indexed from your website goes into the big index mentioned above, along with the content from all other websites. You can, in theory, pull content from any website we have indexed into your search experience. This supports portal search experiences. Like a fishing boat on the water, you’ve decided what fish you’re going after, you know what corners of the lake to go to, and you’ve collected the gear you need to get the fish. Search.gov used to rely on the Bing web index for our main search results. Customers would log in to the Admin Center and use the Domains list to include the content they wanted to pull from Bing. Now that we’re building our index in house, all this remains the same. You log in to the Admin Center and configure what you want your search to return on the results page. We use sitemaps to inform what we index into our system. You use the Admin Center to determine what results will come out of the index when people search on your website. Tributaries feed into a lake, and fishers can go out to any part of the lake to get the particular kinds of fish that they want. The content is added to the index. Meanwhile, the search site had already been configured to include this content within the index. 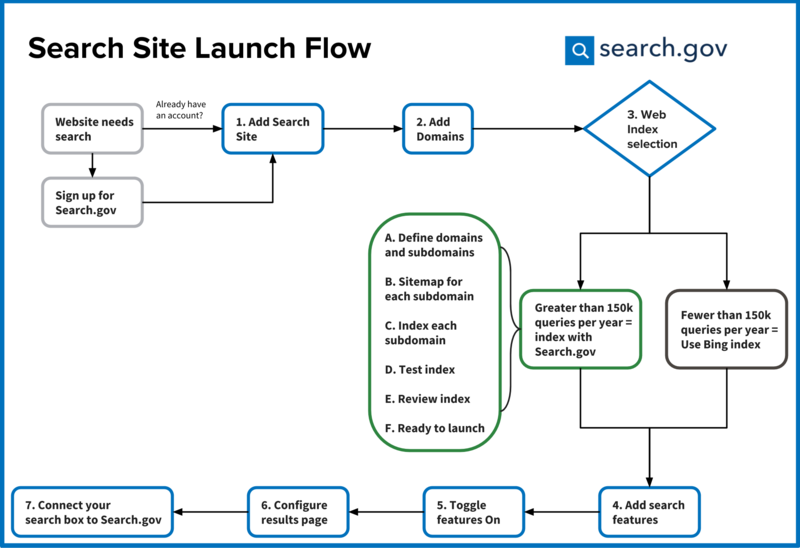 For 18 years, GSA’s Search.gov has transformed the public’s search experience on federal government websites. Agencies use our free, shared service to power over 2,000 search boxes on over 30% of federal domains. This page will walk you through the steps required to integrate Search.gov with your Federalist website. Confirm you have the jekyll-sitemap gem installed in your repo. Read the docs here. Sign up for a user account. Read our Search Site Launch Guide if you’d like some direction. Request that your domain be indexed by emailing our team. Note, the site must be publicly available for our indexer to be able to access your content. Create and configure a search site in our Admin Center. Note: you’ll give your site a display name and a site handle, and you’ll need to enter the site handle in the search box form code on your website. Preview your search results once the indexing is complete. Put finishing touches on your search site in the Admin Center - brand your results page, etc. Add your site handle from the Admin Center to the _config.yml file in your Federalist repo, on the searchgov_affiliate line. Include the _includes/searchgov/form.html search box in your <header> include. If you would like type-ahead search suggestions to appear in your website’s search box, add include the _includes/searchgov/script.html block in your <footer> include.